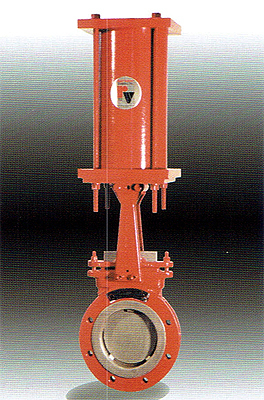 Red Valve manufactures a complete line of pneumatically, electrically and manually actuated Series G Knife Gate Valves. The RD Actuator is constructed of a lightweight, self-lubricating Black Amalgon cylinder, aluminum cylinder heads and stainless steel piston rod. Black Amalgon is resistant to chemical and corrosive attack and is more dent resistant than aluminum or brass. Pneumatic positioners can be used to either close or open the valve upon increase of signal pressure. Optional electropneumatic positioners accept a standard ISA 4-20 mA signal. Listed below is an actuator sizing chart based on 60 psi plant air. Air to open/fail closed and air to close/fail open actuators are available up to 12 inches. 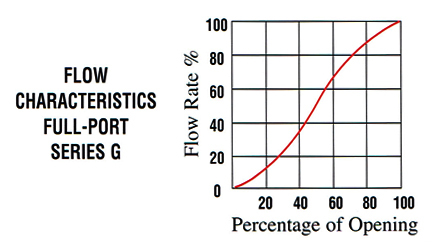 Electrically actuated knife gate valves are actuated by AUMA electric operators as a standard. These operators can be supplied with either 220-volt or 440-volt three- phase service and have a NEMA 4 rating. Standard features include Class F insulation, a double-lead ACME stem thread, bronze drive nut, declutchable handwheel override, opening and closing torque and stroke limit switches, three pushbutton station with selector switch and position indicator. Other electric operators, ratings and services are available. A modulation version is available that accepts the standard ISA 4-20mA input signal. When ordering electrically actuated knife gates, please specify electrical service and pressure drop across the valve. If you have a wear problem Paul Bernard Associates has a proven solution. Feel free to give us a call at 678.522.5800 or contact us online with any questions.